There were a lot of unknowns when I first started working at Heathrow. 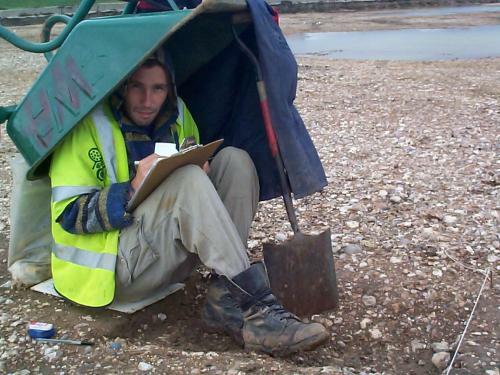 It was the first time Wessex Archaeology and Oxford Archaeology had worked on a joint venture in the field, the recording system was entirely new and relied heavily on bespoke technology which had not been trialled in the field on such a scale. Initially we didn’t even know whether any archaeology would have survived the damage caused by the sludge beds of the sewage works. I arrived on the site in the autumn of 1998 in charge of a small team whose job it was to find out whether any archaeology had survived. This involved watching mechanical diggers remove the remains of the treated sewage from the sludge beds. Pretty soon, it was clear that substantial quantities of archaeology lay beneath the sewage, and a winter of standing ankle deep in ‘cake’, as it was euphemistically called, lay ahead of us. 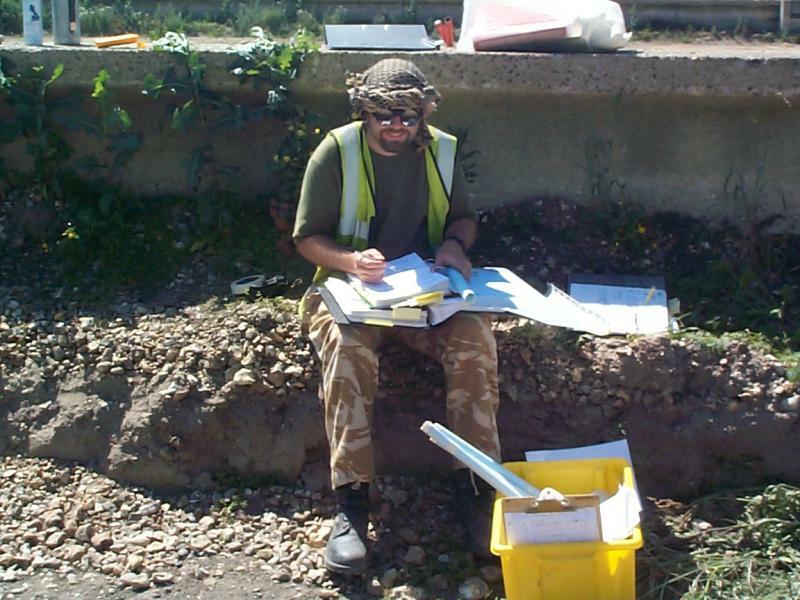 Our small team began the task of surveying the extents of the archaeological features using Total Stations (although an attempt at using a robotic total station was abandoned after we found that it tended to track passing jumbo jets rather than the staff held by the surveyor!). By the end of the winter we had cleared over 20 hectares of land and surveyed the archaeological features in great detail. Despite several washes, I was unable to remove the smell of sewage and aircraft fumes from my working clothes, and had to throw them away. We started the excavation proper early the following spring. The core team of supervisors, finds and environmental specialists and computer officers were on site early, setting up the offices (no mean feat when dealing with a team of over 70) and making all the necessary preparations. Time was well spent in team building and trialling the new recording system before the massive influx of diggers arrived. There was much emphasis on training the site staff in the early days, both in how to use the recording system and in how the on-site database and GIS system worked. One of the main aims of the recording system was to place much greater emphasis on the diggers to interpret the archaeology as well as record it objectively, and they embraced the opportunity enthusiastically. The excavations lasted for nearly seven months and involved over 100 staff. Even small tasks which you take for granted on a small project became issues which needed addressing. We had to find accommodation for all of the staff, and provide transport to and from site – no mean feat in West London. Fortunately the team of project officers and supervisors coped magnificently, and all went well. We excavated a huge number of archaeological features, and found some lovely artefacts. Features ranging from Neolithic cursus and henge monuments to a post-medieval canal were carefully dug and recorded, whilst the nicer finds included polished Neolithic stone axes, a superb assemblage of worked wood from Middle Bronze Age waterholes, a pair of lovely carinated Late Bronze Age/Early Iron Age pots, and a hacked up piece of a lead tank or font from a late Roman pit. The combination of the new recording system and the use of on-site databases and GIS went very well, and we produced an unparalleled digital and paper archive of which everyone involved can be rightly proud. When I look back on it now, though, it is the people who worked there who stay longest in my memory – for their hard work, professionalism and skill, but also for their laughter, sorrow, stubbornness, kindness, stroppiness, helpfulness and occasionally their sheer lunacy. You cannot work on a site for so long with so many people, sharing not only their working day but also their evenings and social lives without forging strong bonds. So when I look back, I also remember the barbecues, the solar eclipse, the parties (one a memorable night on a boat on the River Thames), the arguments, the mad games of park football, and the friendships that were formed. When I look back now at the thousands of photos we took during the course of the project, it is the faces I find myself looking for, and the people that I remember. The archaeologist in me will always remember the excavations and the finds, but it was the people with whom I worked who made it special. Rich Connolly, one of the supervisors, checking context sheets. We had a great team of supervisors, all in charge of small teams. Here you can see the tools of his trade – the box full of recording equipment, rolled up hand drawings and folders of completed context sheets. In the summer, the heat was a real problem, with Heathrow consistently amongst the hottest places in the country, hence the head gear, the sun lotion and the water bottle. 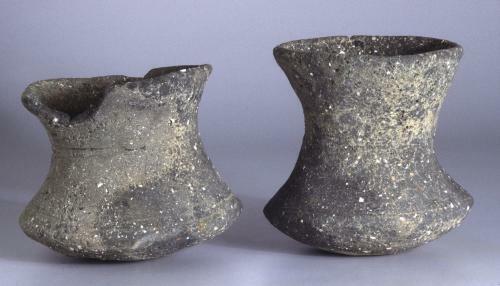 Late Bronze Age/Early Iron Age beakers. These were found placed at the bottom of a waterhole with a larger pot, presumably as part of an offering. I find them such tactile and stylish objects. They are also incredibly unusual – only one other similar vessel has been found from the River Thames. They date to the Late Bronze Age/Early Iron Age transition. This entry was posted in Excavation and tagged Excavation, memories, Perry Oaks, social. Bookmark the permalink.